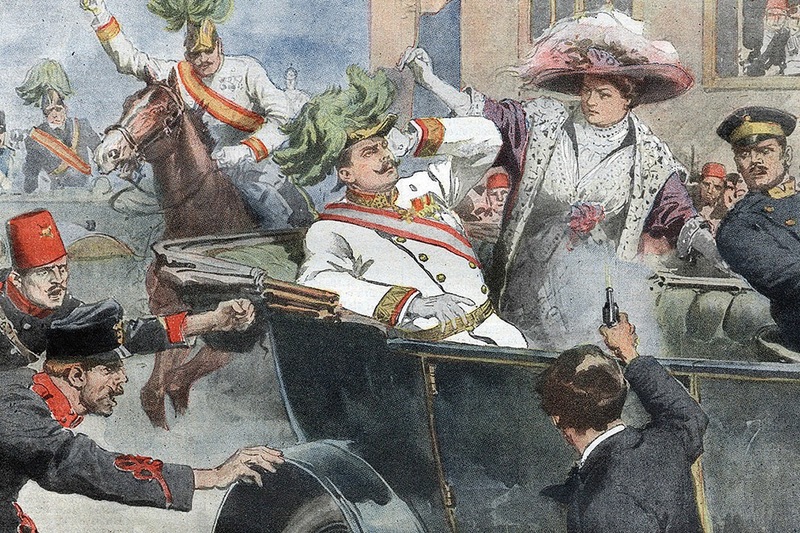 On June 28th, 1914, the Austrian archduke, Franz Ferdinand and his wife, were assassinated by a Bosnian revolutionary, Gavrilo Princip. This triggered the First World War, but the underlying reasons for the war were much more complicated. Numerous factors contributed to political tensions on the European continent which eventually escalated on July 28, 1914, when Austria-Hungary declared war on Serbia. This article will aim to break down the different factors that led to the First World War (or Great War). Prior to the war, a number of alliances had been formed in Europe. This led to a quicker escalation of the war, as certain countries had no choice but to declare war if one of their allies did. The main alliances that existed before the war were the Triple Alliance of Germany, Austria-Hungary, and Italy (signed in 1882) and the Triple Entente of Britain, Russia, and France (signed in 1907). These alliances were defensive in nature, however, it still meant that any conflict between an ally and another country would automatically involve all other signatory countries. The fact that Germany had to face France and Britain on the one side and Russia on the other, greatly influenced its actions during the war. Famous English historian, A. J. P. Taylor, stated that “the alliances created an excessively rigid diplomatic framework, within which relatively small detonators could produce huge explosions.” This came at an unwelcome time, as political tensions in Europe were already on the rise. Some historians claim that the distant origins of the First World War can be traced back to the Franco-Prussian War in 1870-1871. While Germany became a growing powerful Empire, France fell into chaos and military decline for years. Subsequently, France grew more and more suspicious and hostile towards Germany, especially following the annexation of Alsace-Lorraine. This led to a significant chapter in French society, known as revanchism. Meanwhile, Britain abandoned its “splendid isolation” policy and formed alliances with France in 1904 and Russia in 1907, which became the Triple Entente. For Britain, this was a preventive measure against Germany following the Anglo-German naval arms race in the late 19thcentury. Several crises between 1905 and 1914 reinforced these existing alignments and further deepened the polarization of Europe. One being the First Moroccan Crisis from 1905-1906. This was an international dispute over the state of Morocco which aggravated tensions between Germany and both France and the United Kingdom. This was due to Germany’s challenge to France in the Moroccan Crisis. Afterwards came the Second Moroccan Crisis in 1911 (also known as the Agadir Crisis). Imperialism led to rivalries between France, Germany, and the UK in relation to control of Morocco. In April 1911, French troops deployed troops into the interior of Morocco. Germany responded by sending the gunboat SMS Panther to the Moroccan port of Agadir. This led to stronger ties between London and Paris and deeper suspicions towards Berlin. A final significant factor were the Balkan wars and the annexation of Bosnia-Herzegovina. The Balkan wars took place in 1912 and 1913. The two separate wars led to the Ottoman Empire losing almost all of its holdings in Europe. This also led to the weakening of Austria-Hungary, as a much-enlarged Serbia pushed for union of the Slavic peoples. Russia encouraged Slav nationalism which led to increased tensions between the Russian Empire and Austria-Hungary. Especially after the annexation of Bosnia-Herzegovina. After the collapse of the Ottoman Empire, Austria-Hungary awarded itself the right to occupy the two provinces. This annexation worsened the already fragile balance of power in the Balkans. The arguably illegal annexation enraged Serbs and pan-Slavic nationalists. A weakened Russia was forced to submit to Austria-Hungary, however, this did trigger more aggressive anti-Austria campaigns in Russia and surrounding Slavic regions. As a result of all of this, Austria felt that a preventative war against Serbia, in order to undermine its growing power, might have been necessary. When Franz Ferdinand was assassinated, Austria used this as a catalyst to declare war on Serbia. Anti-Serbian sentiments had already been strong among the people and this attack had been the final drop. Two days after the assassination, the Foreign Minister and the Emperor agreed that the “policy of Patience” with Serbia had come to an end. The attack on the heir to the Austrian throne on June 28, 1914, sparked a series of events which eventually escalated into the Great War. This was known as the July Crisis. On July 6th, Germany affirms its unconditional support for Austria-Hungary with a so-called “blank cheque”. On July 23rd, Austria-Hungary set an ultimatum to Serbia, containing their demands for an inquiry into the assassination of Franz Ferdinand. Furthermore, Serbia was to suppress all anti-Austrian propaganda and to take measures to eliminate terrorist organizations. The ultimatum gave Serbia 48 hours to respond. The following day, Serbia sought support from Russia, who advised Serbia not to accept the ultimatum. On the 25thof July, Serbia responds to Austria with less than full acceptance. Subsequently, Austria-Hungary breaks off all diplomatic ties with Serbia. Three days later, having failed to accept Serbia’s terms, the Austrian-Hungarian Empire declared war on Serbia. This incidentally brought Germany into the war as well. The British Ambassador in Berlin, Sir Edward Goschen, was informed that Germany was contemplating war with France and also wished to send its army through Belgium. In the morning of July 29, the Russian army mobilized to assist Serbia. As a result, and due to threats made by Germany against France, Britain and France entered the war. Evidently, the causes of the First World War were manifold, thus, a consensus on the origins of the war remain elusive. Right after the war, Anglo-American historians asserted that Germany was solely responsible for the war, but more recent academic works have blamed all participants more equally.